Symbols with Meaning - What did the Handprint mean? The Native American Symbols and their Meanings were usually based on geometric portrayals of celestial such as the sun, moon and stars, natural phenomena such as thunderstorms and rain and animal designs including eagles, serpents and spiders. 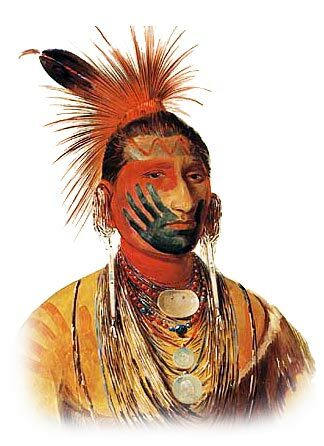 War paint that used by Indian warriors contained secret Symbols and Meanings and even horses were painted with Symbols and Meanings. Many Symbols and Meanings were spiritual in nature conveying various religious beliefs. For additional information refer to Power Animals. Other Symbols and Meanings conveyed immediately identifiable secret messages to other tribe members. The Symbols and Meanings used by Native Americans also had practical purposes such as recording important events, providing directions, indicating good hunting areas or as warning signs and meanings. A full description of the Symbols and Meanings are detailed for each of the subjects shown on the following list.